The gorse, also known as furze, is a large and spiny evergreen-type tree that features sweetly-scented yellow flowers year-round. Although it grows in many places, it is particularly present and admired in Ireland. Ancient Celtic people were highly spiritual and took inspiration and wisdom from all that surrounded them in nature. Druids, too, were very soulful beings and dedicated much of their lives to investigating and understanding spiritual messages that were presented by nature, especially when considering plants. The gorse tree, or more accurately “shrub”, was seen as a symbol of light and vibrancy, obviously due to its physical appearance. It was strongly associated with the sun, again due to its bright yellow color. Beltane bonfires were fueled by the sacred gorse in ancient Celtic tradition, as well. This was fitting for two reasons: the vibrant yellow shade of its flowers and the association with the god of light, Lugh. The canary flowers that begin to open during the spring season were also indicative of the happiness that can prevail year-round. This was so even during times of cold and seeming lifelessness, as many types of gorse keep their flowers no matter what the season. However, gorse also signified a sense of industriousness, intelligence, and stringent independence. The beautiful flowers exhibit signs of energy and confidence in their own intellect, shining as brightly as the sun even in winter. These flowers call us to examine our inner selves. We each possess an energy that is begging to bloom. As long as we nurture this energy and have the confidence to use it, each of us will blossom as beautifully as the gorse buds. It is the most crucial for us to remember this when we find ourselves in times of trouble and/or darkness, whether physically, mentally, or both. Druids, deep-thinkers as they were, analyzed the gorse intently and concluded that it was a ravenous seeker of light, thus making it an opportunist. This is something that natural symbolism speaks of to us quite frequently. Seeds from the gorse can be observed (in good conditions) separating from the parent plant and distancing themselves significantly. They do this for the purpose of beginning a new colony and giving it the best chances of survival, preventing it from being overshadowed by the larger and overbearing parent plant. For humans, this is a sure symbol to take our own leap of faith, trusting our instincts and making a stand for what we want to achieve for ourselves. Conformity is often suppressive, and the gorse constantly inspires us to choose our own path of light. The colorful gorse has also been observed acting as a fruitful haven for bees, the building block workers of all nature. Bees are highly symbolic for us in their own right, demonstrating the benefits of communal focus and activity. The fact that they choose to take their nourishment from the gorse only perpetuates the symbolic grandeur of the shrub. A mutually respective relationship – rather, a partnership – exists between bees and the lovely gorse. This connection serves as a zap of energy for us. We need to stay busy and work towards our goals if we wish to get anywhere. We cannot just sit around and hope for great things to fall into our laps. 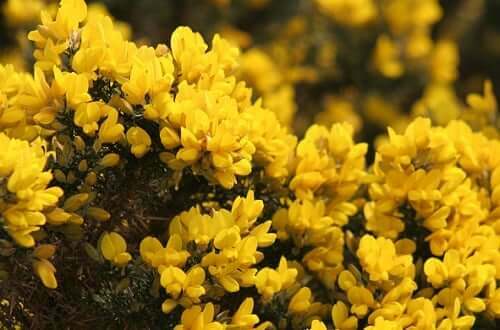 Gorse symbols are also often linked with the sentimental themes of love and fertility. Traditionally, sprigs from a gorse were used in a bride’s wedding bouquet to ensure a happy marriage characterized by fertility. Torches made from gorse were also burned around livestock to protect against sterility. Ironically, though, it was considered to be extremely unlucky to give the flowers from a gorse to another person – both for the giver and the receiver. Gorse wood was also utilized often, as it is a very effective form of kindling. The ashes were then used to make soap. Obviously, the gorse was not only beautiful and symbolic: it was also a great utility.